Password Exporter is a extension add-on for Mozilla products especially Firefox that allows users to export and import saved passwords, login credentials and sites exception list in the Password Manager. The logins, passwords and/or the excluded sites that are exported and backup can then be transferred and imported on any computer. Initially the Password Exporter was developed for Firefox, but the support has since been expanded to Thunderbird, Flock and Songbird. 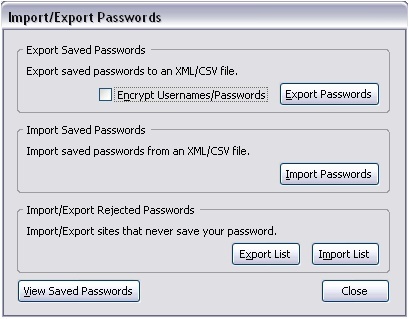 Password Exporter will export the login user names, passwords and exclusion list in CSV or XML format, and users have the option to encrypt the plain text information to safe transfer. However, it’s not foolproof, as user can just import the exported file to see the “encrypted” passwords. Thus if you export the sensitive information, take a very good care of it. Password Exporter supports Firefox version 1.5 or newer, and been tested to be working properly up to latest Firefox version 38. It also supports Thunderbird 1.5 up to version 31, Flock, and Songbird. It will also support future versions of Firefox and Thunderbird. Download and install Password Exporter. Update: Songbird and Flock has been discontinued, thus the Password Exporter now works only in Firefox and Thunderbird.